Water temperature is in the low 60’s and the weathers beautiful. No fish are being caught from boats; most fish are being caught from shore in areas like hetch hetchy and the East Beach. Power bait products are the bait of choice for anglers. Kastmasters and spinners are the go to lures right now ripping out limits. One big stripe was caught in the south end this week. Regular trout plants have been happening at the public launch. Anglers usually start to catch them the next day. 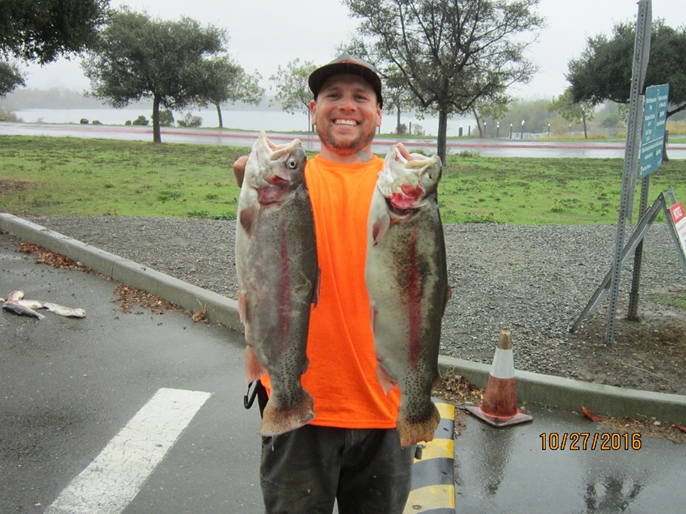 Cody McGarry of Livermore caught 2 nice Rainbows on a jerkbait in the narrows Eric Zaragoza caught 3 trout on a Kastmaster from shore by the pipes. Jacob and Zack of Livermore caught 15 trout on kastmasters and spinners from the shore.